And then, probably the most iconic of all, there’s a whole load of Pimm’s. 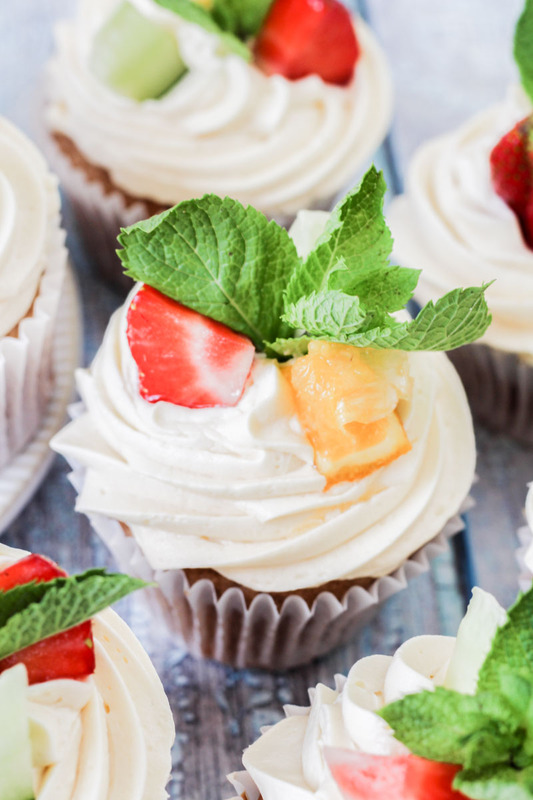 I’m not going to be showing you how to make a glass of British Pimm’s – that’s for another day – but I am going to be sharing with you my brand new recipe for Pimm’s Cupcakes. And just as you might expect, they are as pretty as hell. I don’t even know if Pimm’s is a thing outside of the UK, but when summer comes out in Britain then so does the Pimm’s. When people talk about Pimm’s, what they are actually referring to is the brand’s most famous liqueur – the Pimm’s no. 1 cup, which is most often served with clear sparkling lemonade (think Sprite) and a whole bunch of chopped summer fruits and mint. Pimm’s itself tastes sort of spicy, but when added to some lemonade, it is sort of a British summer ritual that must be adhered to at all barbecues, picnics, or summer parties. My Pimm’s cupcakes consist of three different factors that come together to make the perfect summer cupcake. Firstly, we’ve got a strawberry and citrus cupcake batter. This has been pretty much taken straight from my Eton Mess Cupcakes, with a little lemon and orange zest thrown in for good measure. All my non-chocolate cupcake recipes all have their beginnings in my White Vanilla Cupcake recipe, and are the fluffiest and scrummiest cupcakes of all. My not-so-secret trick is the addition of some yogurt, which helps keep things moist. And the two tablespoons of cornflour or cornstarch make things even softer. It’s pretty much unbeatable. 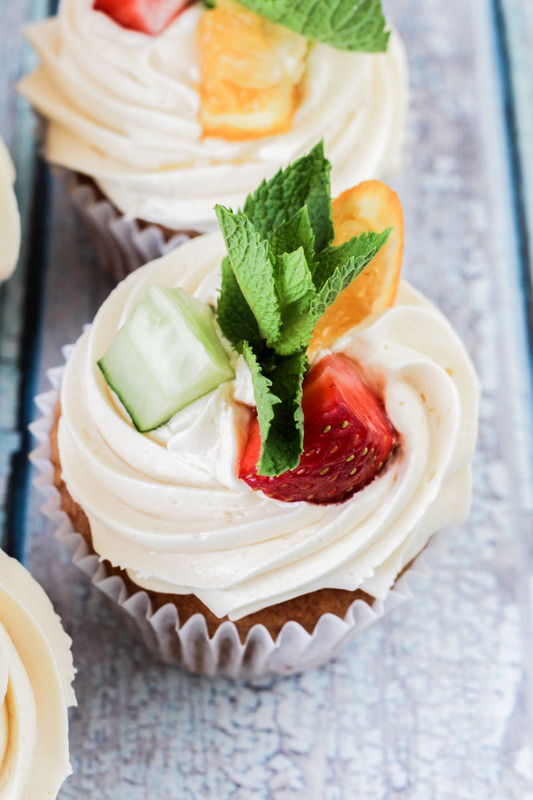 The next step is to brush the tops of your freshly baked cupcakes with a Pimm’s, cucumber, and mint syrup. This is made in the same way as the syrup in last week’s Mojito Cupcakes, by warming up the Pimm’s with some sugar, and then leaving to infuse with the cucumber and mint. I’m not sure how much the cucumber comes through in the syrup if I’m honest, but it’s Pimm’s, so there’s got to be cucumber, right? Poke some little holes in the top of the warm cupcakes using a toothpick or skewer, and then liberally brush the tops of them with the syrup. I brushed each cupcake three times, with a full brush of syrup each time. This pretty much soaks the tops, but if you leave them to cool down, the syrup will soak in and dry up, leaving you with a cupcake that has a distinctive Pimm’s taste. Easy peasy. And of course, then there’s the frosting. Pimm’s cupcakes wouldn’t be Pimm’s cupcakes without a generous helping of Pimm’s flavoured buttercream. The buttercream recipe is nothing groundbreaking or difficulty, just my standard method that always results in light and fluffy frosting, that’s easy to pipe, and even easier to eat. Add four tablespoons of the Pimm’s syrup, and if needed, add a couple more. The buttercream wants to have a distinctive Pimm’s taste, but it doesn’t need to overpower everything. So don’t go wild and add the whole pan of syrup. Trust me. 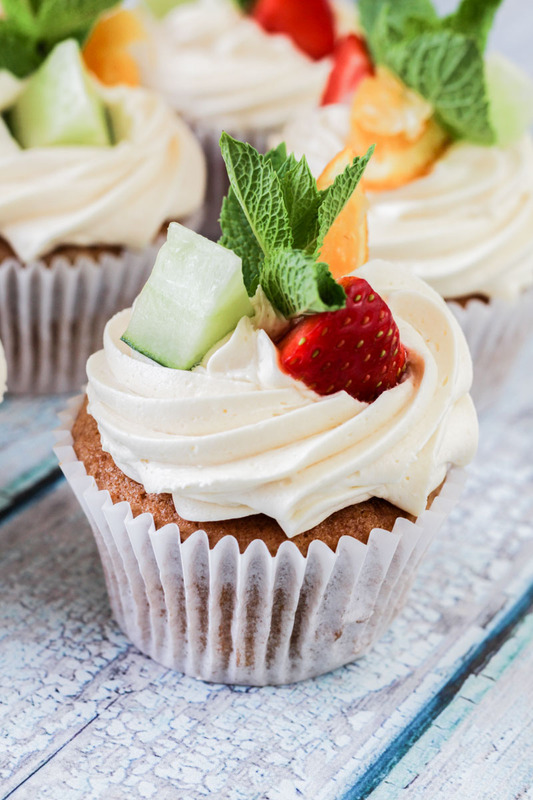 Once you’ve frosted the tops of your beautiful Pimm’s cupcakes, it’s time to get creative with some toppings. I’ve added little wedges of fresh orange, strawberry, cucumber, and a sprig of mint to each of my cupcakes, but feel free to add whatever you normally chuck in your Pimm’s glass. 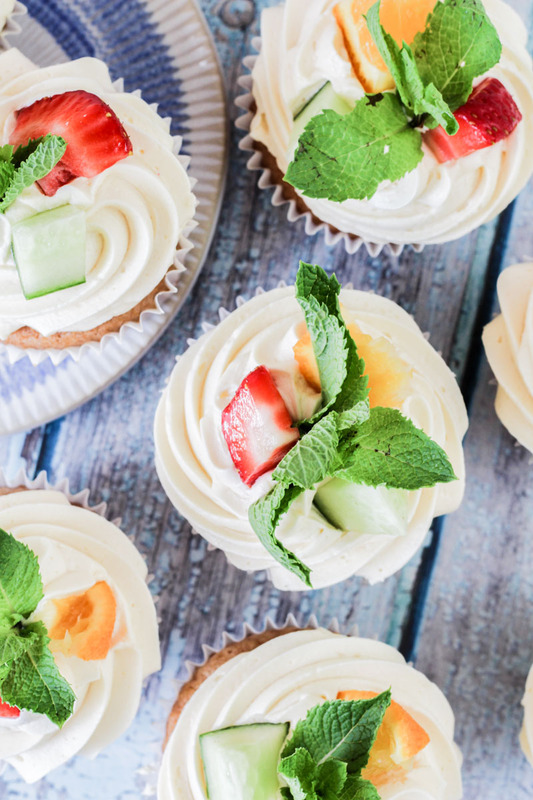 You can even add a little straw if you like – check out my Mojito Cupcakes recipe to see what I mean. If you are going to add fresh fruit, I wouldn’t add it to the tops until you are about to serve the cupcakes, or it can go a little wilted over time. If making a day or two in advance, then frost the cupcakes and store in an airtight container (not in the fridge), and then add your chopped fruit on the day of eating. I’m off to go and obsess about Wimbledon for the next two weeks, so if you don’t like tennis then probably best to unfollow me on twitter right about now. I’m predicting a Nadal win – and you’ve got it here in writing. And let’s all hope for a Roger v Rafa men’s final in two weeks’ time. If you’re going to Wimbledon this year, I am incredibly jealous of you, as I am going to be spending every day for the next 14 days wishing I was there too. Maybe next year? And if you’re not heading to SW19, then just sit back and enjoy the summer with a glass of Pimm’s, a slice of my Pink Lemonade Swiss Roll, and catch all the tennis on the TV. A strawberry and orange cupcake, drizzled with Pimm's & cucumber syrup, and topped with Pimm's buttercream and lots of fresh fruit. The perfect treat this Wimbledon fortnight! Place the Pimm's, mint leaves, sugar, and slices of cucumber into a small saucepan, and stir together. Put on a low to medium heat, stirring occasionally until the sugar has dissolved. Remove from the heat and cover with a lid or saucer, and leave to infuse whilst you are making the cupcakes. Preheat the oven to 180°C / 355°F (160°C fan) and line a muffin tin with 12 cupcake cases or liners. Blend the strawberries in a blender or food processor until liquidised. It's okay if there are a few little lumps of strawberry that you can't get rid of! Set aside for later. Place the butter in the bowl of your stand mixer (or a medium sized bowl if using an electric hand mixer) and beat for a minute or so until light and creamy. Add the sugar and beat well for at least a minute, scraping down the sides if needed. Add the eggs, one at a time, beating well between each addition, until all the eggs have been incorporated into the butter. Add the vanilla, pureed strawberries, and yogurt to the bowl and beat well for a minute or two, scraping around the sides of the bowl to make sure the batter is well mixed. Add the orange and lemon zest and beat again. Add the flour, cornflour, baking powder, bicarbonate of soda, and salt and fold together on a low speed until only just combined. Spoon the batter into the cupcake cases, filling about two thirds full. Bake in the preheated oven for 15-20 minutes, until springy on top and a toothpick inserted into the middle of the cupcakes comes out clean, without any crumbs on. Place the tray on a wire rack, and then poke holes in the top of each of the cupcakes using a toothpick. Strain the Pimm's syrup you made earlier to get rid of the mint leaves and cucumber. Brush the tops of the cupcakes with the syrup, being quite generous. You will not use all the syrup at this stage. Leave the cupcakes to cool in the tray for ten minutes, and then remove and place on a wire rack to cool completely. Add the sifted icing sugar in three or four stages, beating for at least a minute in between additions. Once all the icing sugar has been added, add 4 tablespoons of the Pimm's syrup and beat well. Taste the icing, and if necessary add a few more tablespoons of the syrup. You may need to add a little more icing sugar if the buttercream becomes too runny. Pipe the buttercream on to the tops of the cooled cupcakes using a piping bag and a 1M icing tip. Add mint leaves, orange wedges, cucumber wedges, and pieces of strawberry to decorate. The frosted cupcakes will stay fresh for 2-3 days if stored in an airtight container in a cool place. I would advise adding the chopped fruit to the to the cupcakes on the day of serving, as they wiill wilt over time. The unfrosted cupcakes can also be frozen for up to 3 months - defrost overnight at room temperature. The buttercream can be made a day or two in advance and stored in the fridge. Keep it in a bowl covered with clingfilm, and bring back up to room temperature and beat well before using. The buttercream also freezes well - put in an airtight plastic tub (with room for some expanding) and use within three months. Defrost overnight in the fridge, and then beat well to bring it back to a good consistency. I took some of these into work for the gang and they were a major hit! I mean, who doesn’t love Pimm’s? It’s practically un-British!